← AntiquityNOW Celebrates the Arts on National Arts Advocacy Day! Last Thursday, March 20th, marked the much anticipated first day of spring. At 12:57 pm ET, the sun crossed the equator and the vernal equinox arrived. Many people cheered as winter met its official end, but the date had special significance for Persians. 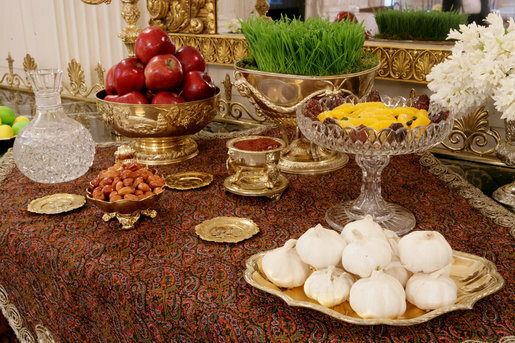 It was the beginning of the Persian New Year or Nowruz, a time for dancing, celebrating and most importantly, feasting! Each year the holiday begins with a special meal enjoyed around the haftseen table, where the foods are symbolic and abundant. In recognition of 2014’s haftseen table, we’re giving you a delicious Persian recipe from this traditional meal that you can enjoy in your home year-round. It’s never too late to celebrate and learn about the cuisine of an ancient culture! Zoroastrians believe there is one God called Ahura Mazda (Wise Lord) who created the world. Zoroastrians are not fire-worshippers as some Westerners have depicted them. Zoroastrians embrace the idea of the elements being pure and fire as representing God’s light or wisdom. Ahura Mazda revealed the truth through the Prophet Zoroaster. Zoroastrians traditionally pray several times a day. Zoroastrians worship communally in a Fire Temple or Agiary. The Zoroastrian book of Holy Scriptures is called The Avesta. For centuries Zoroastrians have celebrated several holidays including Nowruz, which is dedicated to fire and God’s wisdom. It is possible that Nowruz was created in part as a response to the elaborate festivals held by the Babylonians during the spring equinox. The Persians would have seen these celebrations and perhaps wanted to formalize their own New Year holiday. Whatever the actual origins, the holiday was handed down for thousands of years and eventually became disassociated with religion. Today, many different cultures celebrate Nowruz, including Jewish, Zoroastrian, Armenian and Turkish Iranians and Central Asians. As we mentioned, the main feature of the holiday is the haftseen table. Haftseen means “seven s’s” and so the table is named after the seven foods that are included, all of which begin with the Persian letter “seen”(s). Seven is considered a lucky number and each food is chosen as a symbol of renewal. Somagh (sumac), representing light and the color of the sunrise, and senjed (dried lotus fruit), representing love, can also be included. A fish recipe is eaten to symbolize abundance in the New Year. Egg dishes represent fertility and green vegetables call to mind the colors of the season and the reawakening of the earth. Each family has its own recipes using the traditional ingredients, which are passed down from generation to generation. 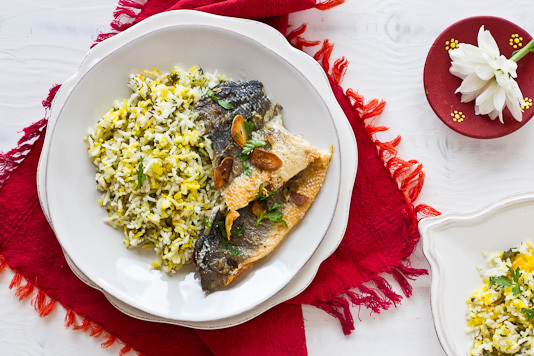 Today we’re sharing the recipe for a favorite in many households, Sabzi Polo Mahi, an herbed rice and fish dish. Enjoy the delicious mingling of herbs and spices as you celebrate a holiday created by the mingling of cultures over thousands of years. Add the finely chopped parsley, cilantro, dill and green onions to a bowl and mix together. I used a knife to chop the herbs but you can also use a food processor; rinse and dry the herbs, pulse each one individually, and then combine. In a large bowl, rinse the rice in 3 or 4 changes of cold water until the water runs clear. Add enough water to cover the rice along with 1/2 tsp of salt. Stir and let soak for 1 to 2 hours. Bring 10 cups of water to boil in a large pot. Drain the rice and add it to the hot water. Boil uncovered for 7 minutes over a medium heat. Pour the water and rice from the large pot into a strainer to drain the water. Rinse the rice with cold water and set aside. The rice should be a little undercooked. Rinse and dry the large pot the rice was being boiled in, and place it back on the stove on medium heat. Add the 2 tbsp of canola oil, 1/2 of the cumin seeds and spread both on the bottom of the pan with a ladle. Gently spoon 1/3 of the rice into the pot in one even layer. Next, spoon 1/2 of the herbs in a thin even layer over the rice followed by another layer of rice. Repeat until both rice and herbs have been used up, ending with a layer of rice. Sprinkle the rest of the cumin seeds on the last layer of rice. Pour 1/2 cup of water around the edges of the rice in the pot. Add saffron to 3 tbsp of hot water in a small bowl and soak for 5 minutes. Pour the saffron water on the top of the rice. Cover with aluminum foil and a tight lid to lock in the steam. Cook for 30 minutes on a low heat. Meanwhile, rinse and pat dry the fish. Lay it on a flat surface and brush a little oil on onside. Sprinkle salt, pepper and 1/2 of the rice flour. Flip the fish and repeat on the other side. Heat 3 tbsp oil in a wide saute or cast iron pan. Cook the fish, skin side down, for 4 minutes. Sprinkle slivers of garlic, finely chopped parsley and salt on the fish and cook until the fish is cooked through. Approximately another 4 minutes. Transfer the cooked fish to a platter. Once the rice is cooked, using a ladle, gently stir the rice and transfer it to a serving dish or a plate. Sprinkle with some chopped parsley and serve with the fried fish. This entry was posted in Blog, Bon Appetit Wednesday, Culinary, Culture, Holidays, Public Life, Religion and tagged ancient food, ancient history, ancient recipes, AntiquityNOW, Bon Appetit Wednesday, Christianity, haftseen table, Judaism, Nowruz, Persian New Year, Sabzi Polo Mahi, Zoroastrianism. Bookmark the permalink.